Uzbekistan did not make it easy for us. Neither did we have a good start, nor a good farewell. We crossed the border near Beynau (Kazakhstan). Although we were favored as tourists by the border guards, the whole process took eight hours. The long line of full packed cars starts already in Kazakhstan, but we decided to drive up and the border guards let us skip the line. The other side is much harder to pass. For several hours we stood in no-man's-land between the two countries. The Uzbeks themselves are treated like cattle by their own guards. While we waited only 2-3 hours between dust and barbed wire, it may well take up to two days until you are allowed to pass. No going back to Kazakhstan, no progress in Uzbekistan. Two cars per hour are being processed in average due to the thorough checks. Every single car is being unloaded even the spare wheel and boot lining. All personal belongings need to go through a scanner - a sad spectacle. Taking pictures or videos is prohibited, otherwise we would have liked to share a few impressions of this hell hole. 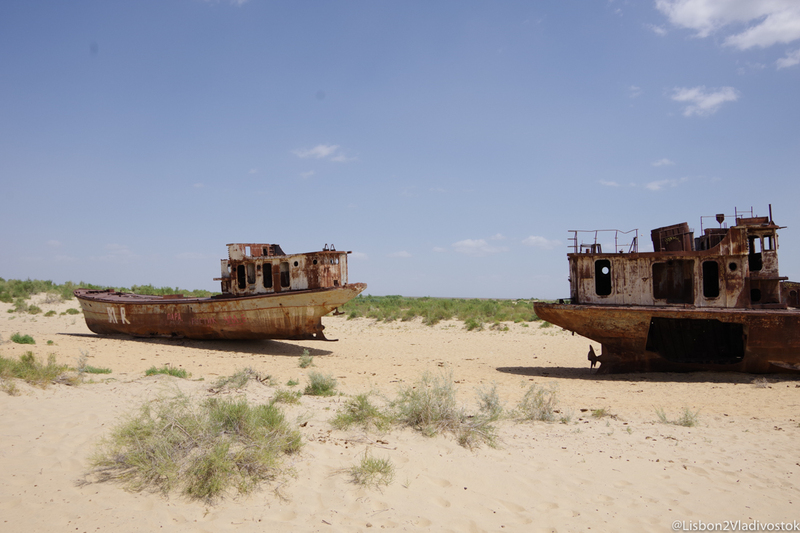 Our first stop is Mo'ynoq, a former port city on the Aral Sea shore. The lake was once one of the largest in the world and has almost completely dried up in the last 40 years. We have put together a short video for RT of what has remained today, which is mainly desert. Having read about this tragedy it is really sad to see how people do not understand or care, that our planets resources are finite and that we must preserve the nature we have. We walk for a while in the desert along the spectacular shipwrecks, where families use to come and collect some of the remaining sea shells. Depressed and moved, we continue to Nukus, the capital of the province Karakalpakistan. Welcome back to the Soviet Union: Not only all cars and houses are the same, but we are also stopped by every single policeman. Each one tries to find a reason to demand money from us - one reason being more absurd than the other. Dima handles the situation bravely and manages to talk his way out of the rip-off. For all Road trippers: Stop at any "Stop" sign in this country, even if nobody is around and it seems stupid. Sometimes the police is hiding and will stop you a few minutes later and ask you to pay a fine (it costs us 10 USD the first time we got caught). Every major city (luckily there are not many) has a gate at the entrance, where you must register with your name and passport number. Pretty old school procedure and we are not sure what will happen with all these books – Dima feels reminded of his past in Soviet Russia. The hotel search in Nukus, is complicated. For tourists the usual price per room is at around 50 USD - dollars and cash only. For a country without decent roads and hardly any gasoline supply this is a joke. The rooms are bad and dirty – not worth even 10 USD. We pound the streets for a while and visit a few hotels, but in the end, we refuse to get ripped off like that. We find a motel outside the city, which lets us camp for 2 USD/night on their parking lot. The hotel prices are made by the state, we are told, so unfortunately, the owners cannot do much about it. Even though we are camping outside, we are still registered with our passports there – just in case somebody decides to check upon the guests. Fast forward to Khiva, at least that's our plan in the morning. But the next obstacle is refueling. At the nearby state gas station there is fresh fuel, but it is filled only according to a list of pre-registrations. Apparently, you have to register upfront and provide the amount of litres you would like to buy. The station attendant first refuses to sell us gasoline. Only after a lot of back and forth and a discussion about how we would really love to explore Uzbekistan, but have not fuel left he decides to fill our tank. The gasoline is not good quality, but the motto here is – take it or leave it. For a week Kolya now has to deal with questionable gas somewhere between 80 and 90 octanes. There will be no other thing in this country. In Khiva the atmosphere is definitely more relaxed. Unfortunately, we cannot stand camp somewhere on the street with Kolya, so we decide to check into a hotel. Cheaper and prettier than in Nukus, but still no bargain. Finally, we can enjoy the Orient in this old former Silk Road oasis. Surrounded by an ancient fortress wall, the old city of Khiva looks exactly as it did 1000 years ago. The Soviets have restored almost everything here and the city has been beautifully preserved. It is quite empty, since there we are outside of the season so we walk nearly alone through the narrow streets. It's incredibly hot outside, but you cannot have everything. On the city market we stock up our supply of fresh fruits and wonder a bit about the chopped off cow feet in front of the butcher shops. Our next step is Bukhara and of course we arrive there after having been pulled over by police at least three times. It is always helpful to have some alcohol in the trunk. Once, when we were traveling too fast, the policeman asked, "Brother Dmitriy, what gifts are you bringing from Russia?" Dima's answer: "I have Vodka with me." Whereupon the policeman said: "Great, bring it." Phew... and on you go. Bukhara is magical. We stay in a small family hotel at a good price and with great hosts. One feels like in 1001 nights in this city. The people are friendly and curious. We meet the parents of our friend Akmal, who unfortunately is not in town and learn what Uzbek hospitality means. As we sit down at the table, the flow of food and drink never stops and after we stuffed our bellies with plov (rice with meat), nuts, fruits and stuffed dumplings, Akmal father takes us on a private city tour. A great guide with many good stories in his backpack. He knows the best places for taking photographs and explains the origins of Islam. Finally, we understand the war between Shiites and Sunnis and why people pray five times a day. I really liked his lovingly told stories about people. Here's one of them: people are like fingers, sometimes small, sometimes thin, sometimes thick and crooked, but in the end, everyone is the same, has the same purpose and all belong together. That's why one goes to the mosque, one likes to drink beer and one likes doing both. The most important thing is that every person is good in his heart. Right! We spontaneously stay one night more to drift around for a longer while in the Orient. We do not care much for the bazaars and pass them by quickly. They are nice to look at, but are overcrowded and for the most parts a tourist trap. If you do not bargain, you pay at least four times the price and usually we have no desire for "...hello, hello real silk and nice carpets". Instead we chill out on the shadowy benches in the park and lay around and drink tea on the bed-like Uzbek tea tables. The many colorful mosques with their flowery tiles, oriental patterns set us back mentally into the time of the former caravans and so we day-dream a few hours in the afternoon. For the nostalgic among us there are still many relics from the former Soviet Union like a water machine: Supposedly the cleanest water in the city according to the owner. Or how about the beautiful gray and sandpaper-like toilet paper that is still available in almost every public place here – surely everyone can even remember the beautiful feeling. Next, we continue traveling north to Samarkand, the third pearl on our way. Akmal's father said that Bukhara is a natural beauty and Samarkand a made-up beauty. He is completely right. The blue and turquoise domes of the mosques and madrasas look astonishingly beautiful and shine in the sun. However, Bukhara had more flair. Before we go into the Registan, we once again get a sense for the corruption in the country: A police officer picks us up from the official ticket counter and offers us the entrance tickets for half the price. As it is a good deal we agree and can skip the line with his help. Actually, we were planning to spend some day in Tashkent as well, but in Samarkand we ran out of money. After having failed to get any cash in this city we decide to head to the border and leave Uzbekistan, we had enough of this country anyways. The history and the buildings of this country are unique and magical, but for self-travelers it is very exhausting. The government still tries to prevent too much Western influence which explains the elaborate border control and strict registrations everywhere. The people however are usually curious and stare at us. The brave ones ask where we come from, others quickly drop their eyes and keep walking. Life is made unnecessarily difficult here and we spent too much time with police and passport controls. The country has a lot to offer for potential tourists, but still has a long way to go with its broken roads, low gasoline supply, rip-off hotels, registrations and passport controls at every turn. Without Russian you are completely lost. It probably works better with organized tours, but as a self-driver – it is really challenging and an adventure. Shortly before the border, on our way out, we are again pulled out by two policemen. They are absolutely convinced that Dima has been drinking, although it is 2pm in the afternoon and we did not have any alcohol for days. Just to make sure they fold a piece of paper into a roll and ask Dima to blow into it. We can’t decide whether we should laugh or cry at this? The policemen now try to convince us that we need to do a blood test, the doctor however is off today and will be back tomorrow. We of course can pay a small fine and continue driving – no big deal. No problem we say, we have time and can wait until tomorrow. After some discussions they let us go and we race outside this country into Kazakhstan. Bring as many dollars as you need. It is almost impossible to withdraw money in Uzbekistan. Maybe there are more opportunities in Tashkent, but we did not find any in the other cities. In Samarkand, there are probably some banks (Aksa Bank for Mastercard and Capital Bank for Visa), but you have to find them first and then they also have to be open. There are no ATMs in the city. Change money only on the black market, because you get twice as much SOM than by the official rate. For a dollar you currently get 8000-8500 SOM (as of June 2017). No need to search for an exchange shop, tourists are being approached almost everywhere. Refuel when there is gasoline available and always have a canister with you. Gasoline quality varies from bad to very bad, but our car coped with that.